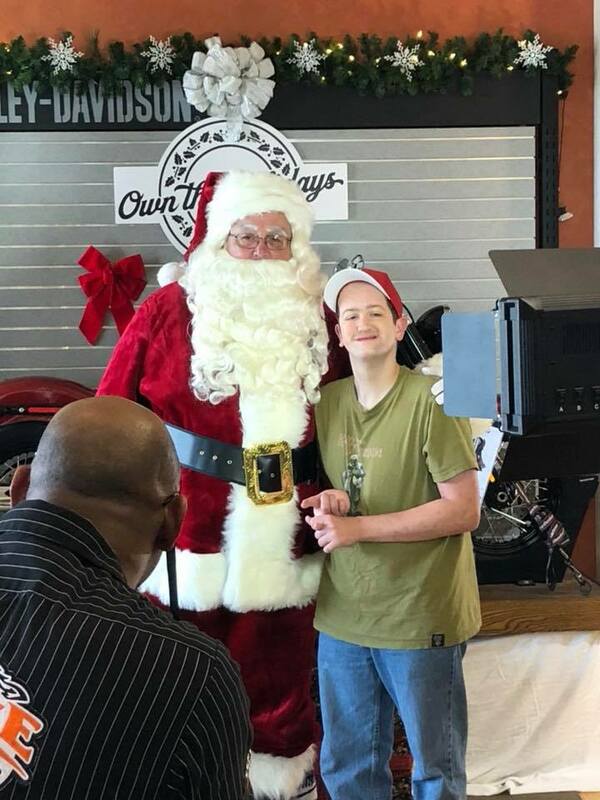 Jennifer Pallone says she is a little overwhelmed at the attention her video is getting of of her son, Andrew, meeting Santa last weekend at a Harley-Davidson in O'Fallon, Illinois. Andy, 24, has a chromosomal abnormality called 15Q24, resulting in developmental delays, some mild orthopedic problems, a hole in his heart and low muscle tone. He was the first person in the United States to be diagnosed with the disorder; he is the oldest in the world with it. He lives with Community Link where he helps deliver Meals on Wheels. "He loves the grandmas and the grandpas (at Meals on Wheels). My biggest fear is that he's going to hug them too hard," Pallone said. Andy loves motorcycles so his mother took him to Harley Davidson last Saturday. When he spotted Santa, she knew it was going to be magical and started filming on her phone. Pallone posted the video on Facebook where it has quickly gone viral with millions of views.